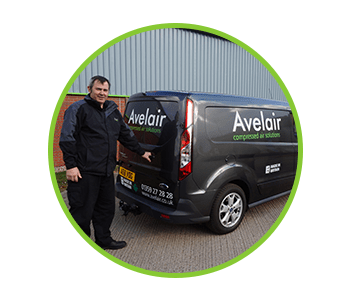 Avelair’s service team offer professional and cost-effective servicing of air compressors and air treatment equipment to ensure you obtain optimum performance in terms of reliability and efficiency in your compressed air equipment. The team operate a 24/7 service and breakdown support ensuring that we are there to help when required. Safecontractor and ISO 9001 certified ensures a high level of competency in skills and Health and Safety. Our Engineers are trained in Compressed Air Safety, Safe Practice Working, Manual Handling, Risk Assessments, COSHH, Fire Safety, and Working at Heights as a minimum. They are also IPAF Scissorlift certified, Forklift trained, Compex certified for Hazardous Areas, and F-Gas Refrigerant Certified. Our training in continuous ensuring Health and Safety is always the priority. With over 100 years of experience within the team, we can offer unrivalled levels of service in maintaining air compressors, refrigerant air dryers, compressed air filtration, condensate management systems and nitrogen generators. Contact us to see how we can assist with your air compressor servicing in Suffolk, Norfolk and Essex, on 01359 272828 or email service@avelair.co.uk.